I've been visiting Baguio since I was in college. I went with classmates, friends, the rest of the youth population and colleagues. 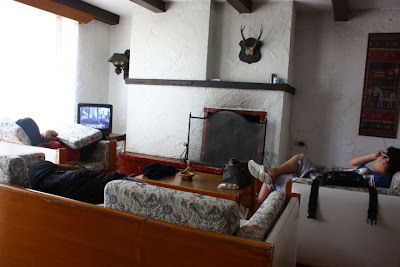 I've experienced staying in transient apartments, hotels and the famous Teacher's Camp. This year, I went with relatives and their friends and families. 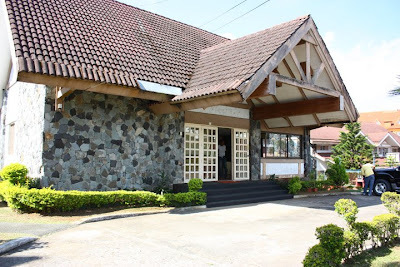 We have been discouraged to go there at first because it was Holy Week and they said it would be swamped with tourists. Still...we went. Good thing we did. We were excited to reach Baguio Highlands. It's easier to reach the place from Marcos Highway. A little far from downtown but once you get there, it's like a haven. Up on the mountains, clouds within reach and it's very peaceful. A place away from the city but a place where you can see the whole city. I enjoy the high lands because I am usually stressed out by the Metro. It reminded me of the country side when I went to London. Baguio Highlands has a touch of a European style. It even has a chimney which we were not able to use because the temperature was just about right. We stayed at a three-storey villa. I only have a few photos of the inside to share because the moment we got in, everyone just started to find and marked their favorite place. So I was not able to take photos of the whole place on its original state. Let me describe it at the best as I can. First floor would be the dining and living room with a terrace, counter, maid's/storage room, kitchen and a toilet and a bathroom. The second floor has the master's bedroom with a terrace and it's own toilet with shower and another room with a separate toilet with shower. The third floor is a spacious attic where it has beds and a huge space you can roll over. It is fully furnished. The attendant has almost everything we need. In case you need to get a hold of basic needs, there are stores before you enter the Green Valley Village gate. Outside, it has it's own playground (swings, see saw and slide) and a grilling station. It has a court where you can shoot the ball or play any raquet sports. Kids can ran and play around safely. A good jog or walk up and down the hill is also recommended. 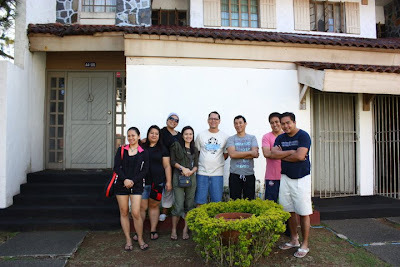 This experience had made me fall in love with Baguio for the first time even if I had visited the city several times. I hope to have my rest house up on those mountains one day. Thanks to Sir Val and Sir Mike who owns the place for welcoming us. Check out this place at Phase IV, Green Valley Village,Sto. Tomas Road, Dontogan, Baguio. hello! whats the phone number of this great hotel?